You have the perfect vision for your wedding day — the date and location, the colors and band, your guest list, and, of course, the cake. You may have replayed every aspect of your big day over in your mind, memorizing every detail. 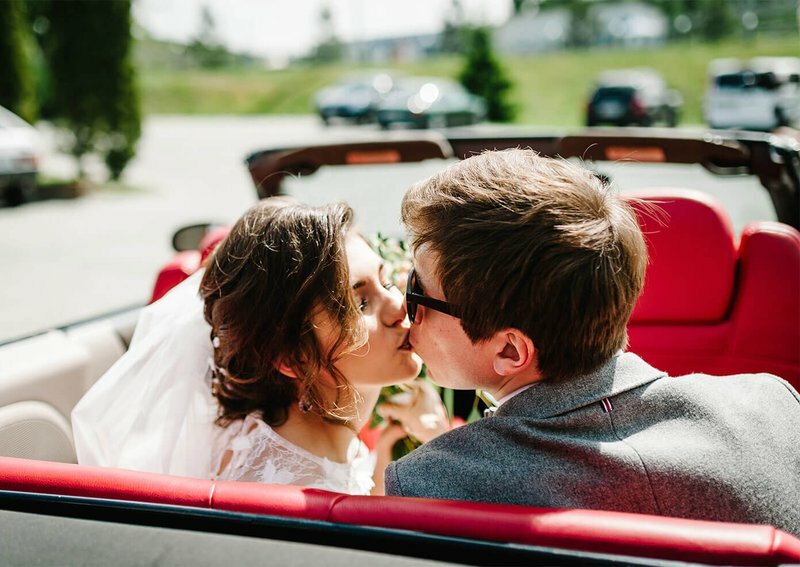 One often-overlooked aspect is one that comes at the end of your big day — the getaway wedding car. Whether you rent a car or use your own, you’ll want to depart in style. There's nothing worse than relying on an eyesore of a vehicle to bookend an otherwise-flawless sendoff shower of rice or rose petals. 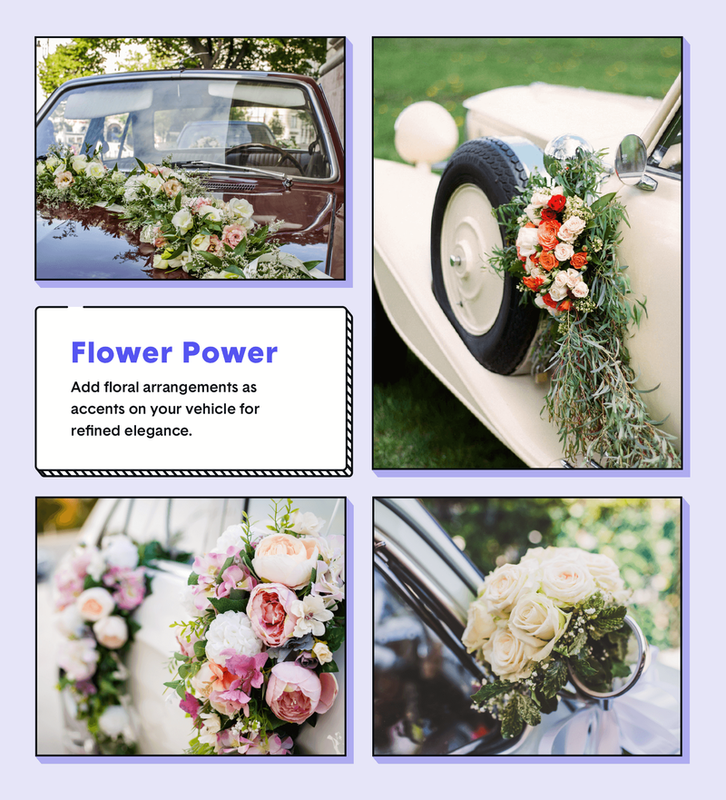 That’s why we created this guide to help you find your ideal wedding car decoration style for the ultimate "wow"-worthy wedding exit. There's no easier way to beautify your getaway than by dressing it up with floral arrangements. If you simply can’t have enough flowers, this decoration type is right for you. 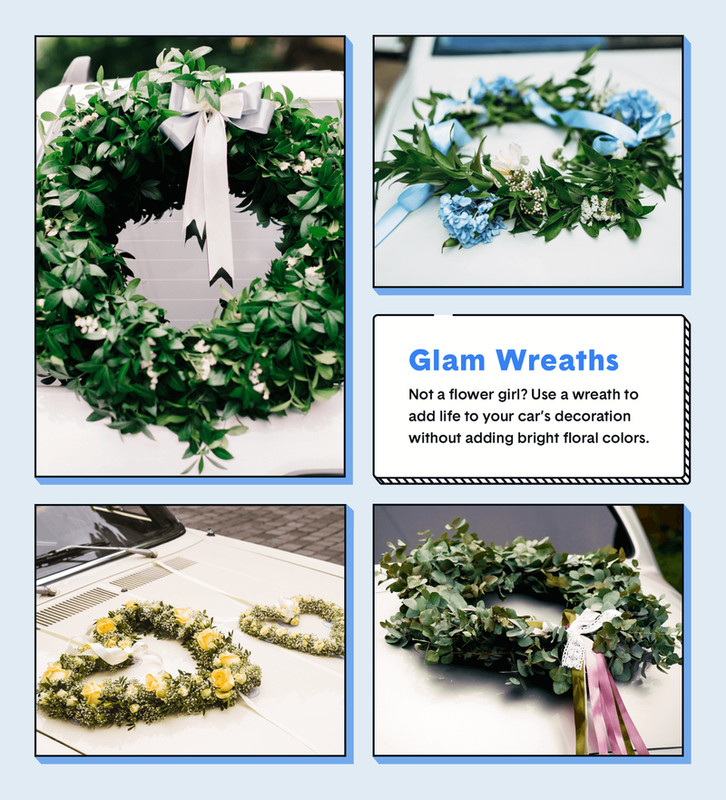 Consider adding a floral wreath to the trunk or adding small groups of flowers on the door handles and side mirrors for some added pop. The “just married” sign is the classic way to let everyone know you and your sweetheart are headed off into a lifetime of happiness. There are many ways to add your own unique spin this timeless decoration — consider painting “Just Married” on a wooden sign for a more natural approach or adding streamers and cans on strings to keep with the traditional vibe. If done right, ribbons are among the most glamorous of decorations. 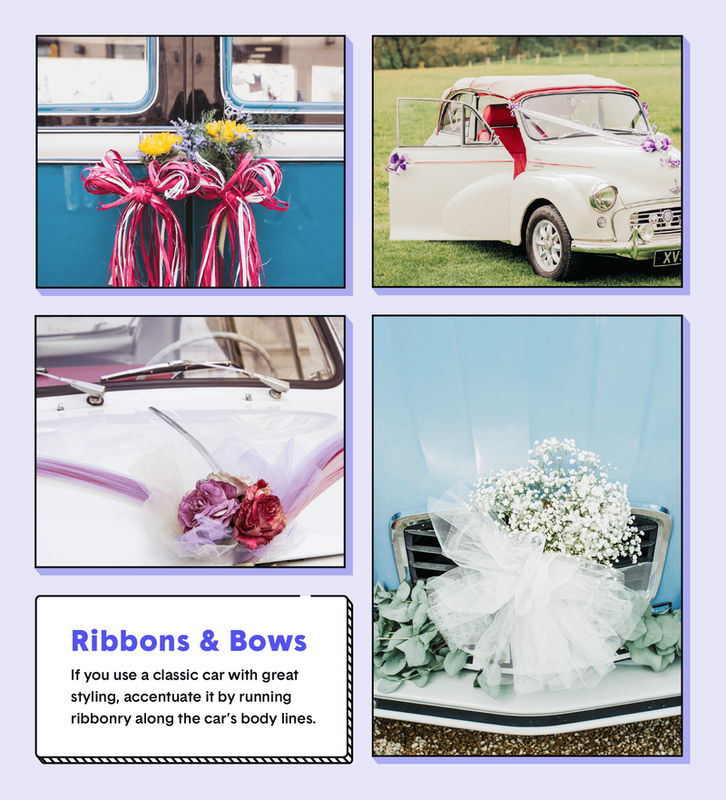 Pick colors that match your wedding theme and have a professional wrap your wedding car in beautiful ribbonry. Add a large bow to the hood or trunk of the car and run ribbons along the body lines to elevate the styling of the car. Not everyone loves bright colors and floral decorations. If your taste is more subdued, consider adding a garland wreath instead of a flower arrangement. A wreath can add a touch of greenery and charm without being overpowering. Use the rule of thirds and place your wreath in the top left or bottom right of the hood. Consider a heart-shaped wreath to add detail. 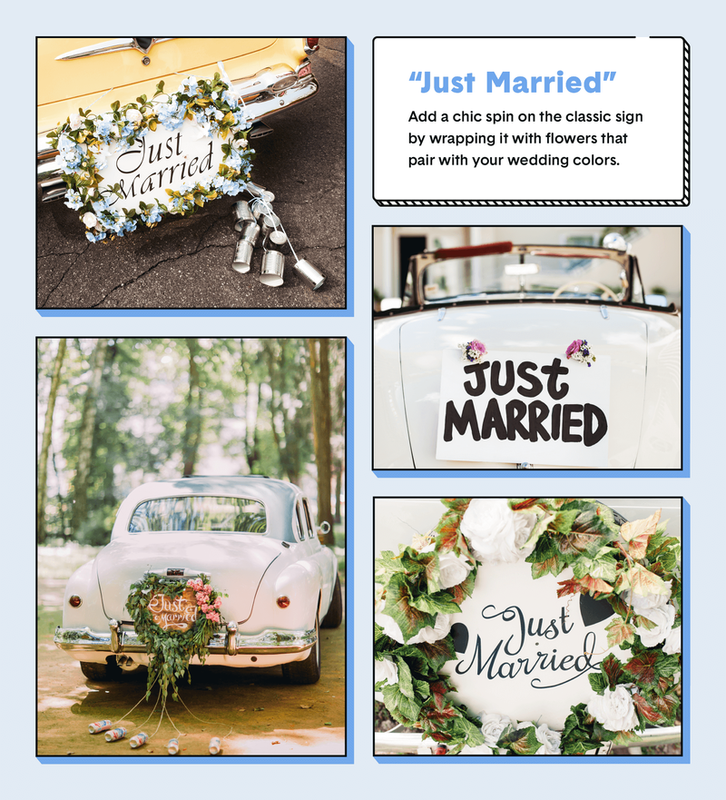 Whether you’re just starting to plan your wedding or you’re wrapping up the final details, our guide to wedding car decorations can help you plan at any stage. Once you’ve tied the knot with your soulmate, look into perks and benefits for newlyweds — you might be surprised by the opportunities!